How Does the Fed Manage Inflation? Cycles of inflation and its opposite number deflation have been part of the American financial landscape for well over a century. While some of these cycles are affected by outside events such as wartime, what many consumers don’t know is that our very own central bank, the Federal Reserve, plays a very active role in creating the rates of inflation that push prices up and buying power down. 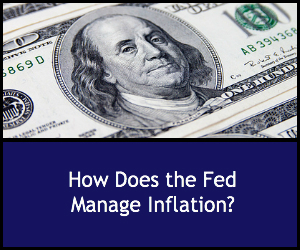 The Federal Reserve took on the job of managing inflation back in 1913, and the country’s money manager has been on the job ever since, with interventions and adjustments aimed at keeping the overall inflation rate hovering around two percent. The Fed uses several models for evaluating inflation, such as the Consumer Price Index, which tracks the actual cost of buying a set amount of fixed price good, Personal Consumption Expenditures, and other models established by the Department of Labor and other bodies. Why would the Fed want to maintain a two percent inflation rate – or any inflation rate, for that matter? In the positive inflation model, when prices are higher, wages are generally higher too, and that keeps the economy growing. The dollar buys less, but prices stay up and the economy avoids recession. If that doesn’t happen, the country could face a period of deflation – the opposite of inflation, when wages fall and so do prices. That could set the stage for the dreaded deflationary spiral of cycle after cycle of dropping prices that eventually leads to full blown depression. As the Federal Reserve sees it, a little inflation offers some security against the threat of a deflationary spiral. As long as a modest amount of inflation is in place, prices won’t fall far enough to damage the economy as a whole. That magic two percent of “protective inflation” is set by the Fed’s Federal Open Market Committee, a board that has determined that that number is reasonably consistent with the Fed’s mandate to keep prices stable and boost employment. To do that, the FOMC directly intervenes in the nation’s monetary policies both domestic and international. And those manipulations affect both national policy and average consumers trying to balance a budget. The primary way the Fed adjusts inflation rates via the FOMC is through tweaks to the federal funds rate, or the rate banks charge other banks – not consumers – for short-term loans. Although those rates pertain to bank-to-bank transactions, movement on the federal funds rates is passed on to other short term lending structures. Movement in those short term lending rates in turn affect long term interest rates for things like mortgages and business startups – and activity there boosts economic growth and keeps money moving via consumer activity. When the Fed reduces the federal funds rate, it has a ripple effect that creates a stronger demand for goods and services. Prices go up, wages go up, and inflation prevails. Those conditions can affect consumer confidence and business growth too, in terms of willingness to invest, take out mortgages and other loans, and manage assets. Times can get tough, and inflation levels can spike. That’s what happened in the twentieth century, when inflation soared after each of the two world wars, and deflation plunged the country into the Great Depression of the thirties. When economic conditions indicate a dive into recession and depression, the Fed can resort to what it calls “nontraditional” ways to manipulate the nation’s money supply. That’s what happened after the massive housing collapse of 2008. In the years that followed the crash, the Fed embarked on a plan known as Quantitative Easing, which involves much more than adjusting federal funds rates. Between 2008 and 2014, the Fed undertook three rounds of Quantitative Easing. The last and most ambitious of those involved buying up billions of dollars in longer term mortgage backed securities, government notes and Treasury bonds. The goal of QE3 was to stimulate the economy by pushing down bank interest rates for loans like mortgages so that more people would borrow and more money would circulate in the economy. Because the Fed can initiate its “nontraditional” interventions whenever it chooses, it can also end them when the economy picks up, and that’s what happened in 2014, when the Fed decided that conditions had stabilized enough to begin tapering off its massive securities buyup plan. The Fed’s role in adjusting inflating rates doesn’t stop on the domestic front. What happens at home also has implications for international currency trading and the value of the dollar. High inflation – or correspondingly, deflation – affects the movement of gods and services worldwide and the value of the dollar against other currencies. Does housing Drive income inequality?